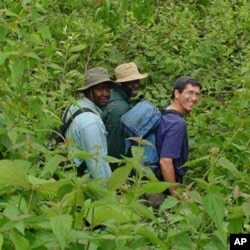 Cameroon teams of researcher in diverse fields are helping to breath fresh life into the arid northern regions bording the Sahara desert. Thanks to their efforts, high-yielding fruits, vegetables and cereals now flourish in all parts of the country. Besides agriculture, others work in the fields of HIV/AIDS and cancer research. They represent only a small number of skilled researchers from Cameroon. Many of them leave to settle and work abroad, depriving the country of the innovation and creativity it needs to promote development and growth. The reasons for the brain drain are varied. Departing researchers generally talk of poor conditions, and there are problems with funding, a lack of encouragement from the government and a little recognition for their work. Cameroonian researchers began leaving the country in the mid-1980s, when a severe economic crisis forced authorities to curtail spending. Researchers, especially those working at the universities, watched as their salaries dropped by over 70%. The situation deteriorated even more with the devaluation of the CFA franc. Some researchers left their scientific work for more lucrative sectors, like business; others went into politics; and many left the country in search of better opportunities. It was a devastating blow for research in Cameroon. But the government is beginning to realize that bringing together researchers at home and abroad could significantly contribute to national development efforts. This year it set up a $9 million dollar fund to help modernize and improve research in the country's seven state-run universities. It’s also funding a network of researchers and investors to transform research results into jobs. The government has also begun holding a research showcase forum every two years called “Week of Excellence” which features scientific research and innovation. Beginning in 2007, the event, held in the capital, Yaoundé, has brought together researchers from around the country, as well as many working abroad. This year the government has invited Cameroonian researchers in the Diaspora to return home and play a part in national development. One of those targeted by the government in this effort is Mola David, a 39-year-old expert on renewable energy and the CEO of Mola Solaire, a solar energy company based in Germany that's expanding operations to the Caribbean islands and the United States. “I started my activities in Cameroon, my home country," he says, "but I had no success, so I decided to start somewhere else, in Germany. I want to do something for my country but I have to find good conditions. I am here to see what is possible and what is not. " "For an entrepreneur, the important thing is to see clear rules in the country," he continues. "If I create a company in Cameroon, I have to know the cost, the political and also the social situation because I’m taking a risk when I invest in a country." Like Mola David, a good number of Cameroonian researchers abroad have become citizens of the countries where they’re working. Cameroon’s government refuses to recognize the practice, but the scientists are calling on authorities to follow the example of countries like China and South Korea. Years ago those countries dropped their objections to dual citizenship and took steps to encourage their researchers in the Diaspora to return home and play key roles in developing their countries. “Cameroonians abroad need support,” says Mola. “I’m talking about just one single thing – double nationality for Cameroonians. There’s a number of Cameroonians who’ve decided to live abroad or to take another nationality and our government is not able to say that you can have double nationality, and they decide to stay away. "I know that many other countries have created conditions making the way home very simple," he says. "If these people know that there are some rules or some conditions that are good for them, they will also come back to the country." The scientists are calling for an encouraging environment, including tax breaks, more subsidies, reduced red tape in the creation of businesses, the promotion of research results and better intellectual rights legislation. They say steps like these would reduce brain drain and increase growth and development.